This blog post is inspired by an article found in the online Lethbridge Herald archives dated May 1st, 1912. There is tons to find there, you should check it out. Once upon a time in Lethbridge there was land. Lots of land. It was 1912. Canada was full of potential and promise. Canada had been advertising for 20 years worldwide to attract settlers to this ‘most progressive of colonies’. But the time of free farms was running out. It was Alberta’s last great land rush. Have you ever seen a land rush depicted in a movie? It was probably American style. Hundreds of horses and carriages—personally, I don’t know why anyone would burden themselves with a carriage—lined up, anxious to begin the race of a life time. Then with the boom of the cannon, each man (it was mostly men) burst forth, their faces set with determination. They each have a chance to provide security for their families for generations to come. With the stakes this high, the race would also involve, inevitably, some bloodshed. Needless to say, this system did not exactly foster neighbourly friendships. But it was a heck of a good show. For this very reason on May 1st, 1912, hundreds of people gathered in Lethbridge to file for a homestead in “The Lease Country” – a 90,000 acre tract of land between the Milk River and U.S. border, previously sub-leased by the McIntyre Ranching Company. Most of the people came for the land, but many came simply to watch. As it turned out, this assembled crowd of onlookers left a little disappointed. Not because of a lack of success for the landless; over 300 people were given plots of land that day. The disappointment stemmed from boredom. You see, the Lethbridge authorities had made it their mission to avoid the chaos and violence involved in the customary land rush. Canada had previously employed the line method. This involved getting in a line and waiting and waiting and waiting—not unlike the iPhone 5 lineups earlier this month. But even this had potential for mishap, like budging, and the fistfight that would unavoidably follow. To prevent this, they allotted each person a square of the side walk, which was numbered with chalk. The result was a day that passed with no incidents; “neither jostling nor dispute”. Not exactly the competitive yet romantic thing one might imagine from Alberta’s last great land rush, yet grand all the same in the opportunity it afforded so many. This even included two women, which was still fairly cutting edge back then. Despite its flawless performance, it is still a tale of adventure; an internal adventure. Imagine after weeks of hoping and waiting, being practically given a piece of land; all your fears turned to relief. It was a chance at fresh start. It is hard imagine a time when land was so available it was free. One hundred years ago, the world was still an unfilled and unexplored thing to be conquered. Our mentality is now so different. The world is delicate, that we cannot continue to mistreat. And rather than expansion being the goal, it must be something else; to sustain it. 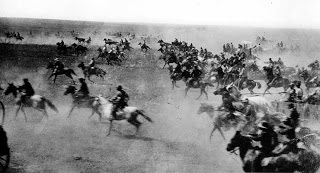 This last great land rush in Alberta was anti-climactic in its sensibility. It was called “humane, sanitary, and in every way acceptable”. As funny as that line is, it’s true. They chose the safer (humane) route over the more entertaining and easier one. They chose the future consequences over their present ease or enjoyment. The question is, what are we—today—going to choose, when it comes to how we treat our planet? What is easier or what is better for our future? To find out more about land rushes (and so many other things), a visit to the archives is a must! Check us out online or visit us here at the Galt Museum Archives.